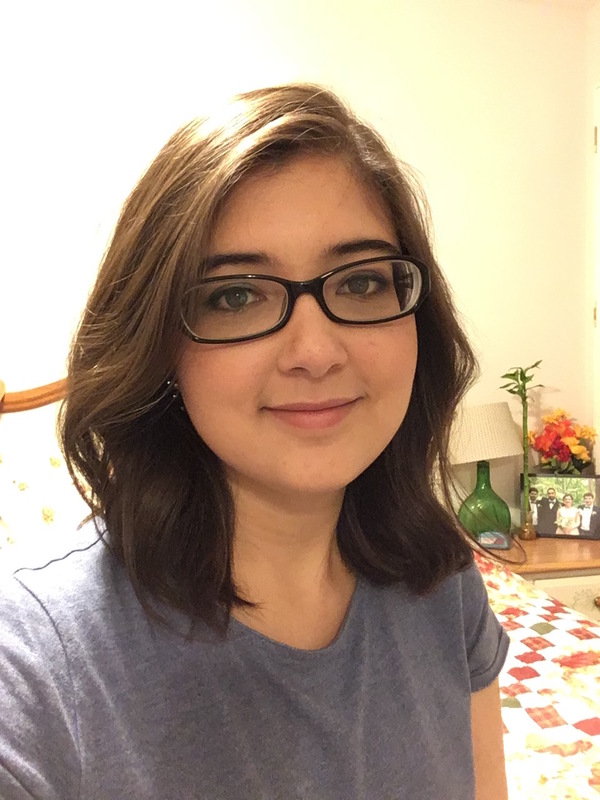 Katrina Sahawneh wrote this post as a final project for Stacy Krueger-Hadfield’s Science Communication course at the University of Alabama at Birmingham. Katrina is working on her MS in Biology and her MA in Education. She currently is studying ER stress and pathogen immunity in Arabidopsis thaliana in Dr. Karolina Mukhtar’s lab. In her spare time, she enjoys drawing and painting. Have you ever been in the middle of two people giving you the opposite advice on what to do? Well, it turns out, plants have this problem, too. Just like you and me, plants often encounter pathogens that want to use them for ill. One category of pathogens is necrotrophic, like the fungus Botrytus cinereathat is often seen growing on strawberries and other fruits in the grocery store. They need to kill the plants to feed off them. 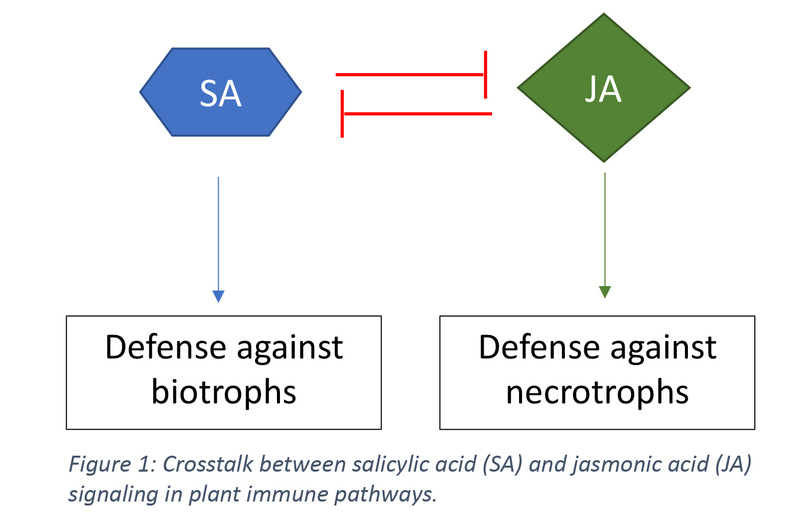 Plants have a variety of immune responses to this type of pathogen which are mediated through the phytohormone jasmonic acid. The other category of pathogens is biotrophic. They need to keep the plants alive to provide a continuous food supply. 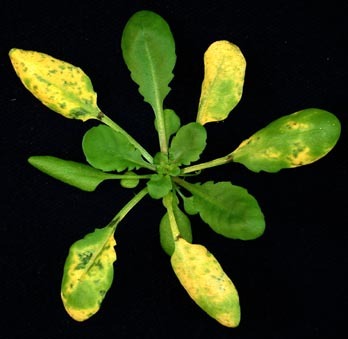 One of the plant’s main immune responses to this type of pathogen is to kill cells immediately surrounding the pathogen. This traps the intruder in an island of dead tissue, and is mediated through the phytohormone salicylic acid. Yes, the same salicylic acid that is in your face wash.
As you can imagine, these two hormones promote very opposite responses. In fact, the upregulation of one hormone inhibits the production and metabolism of the other (Figure 1). It turns out that some plant pathogens have picked up on this antagonistic system. Mittal and colleagues (1995) discovered that the plant pathogen Pseudomonas syringae produces a toxin called coronatine that dramatically increases the bacterium’s ability to infect its plant host. Structurally, coronatine is almost exactly like jasmonic acid. It binds to the same receptor to activate transcription of three homologous NAC transcription factors. These transcription factors in turn change gene expression to promote stomatal opening and suppress salicylic acid accumulation. The plant epidermis is much like our skin, not much gets through unless there is a break or natural opening. Bacteria take advantage of plant’s stomata by entering into the openings generally left open to allow for gas exchange. Thus, closing stomata when a bacterial pathogen is detected is a part of the plant’s immune response to close its stomata when a bacterial pathogen is detected. The three transcription factors activated by coronatine induce re-opening of the stomata, allowing bacteria to continue to invade the plant (Zheng et al. 2012). The three NAC transcription factors also suppress salicylic acid accumulation by directly targeting expression of enzymes involved in salicylic acid biosynthesis, storage, and metabolism (Zheng et al. 2012). Since salicylic acid mediates immune responses such as increasing levels of reactive oxidative species that do not permit bacteria to grow and multiply, the ability of bacteria to inhibit this phytohormone’s accumulation allows the bacteria to have a much more welcoming environment to call home. 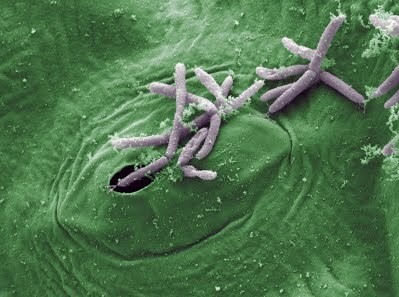 So the bacteria trick the plant’s own systems to allow it to infect and grow. Talk about a master manipulator! Mittal, S., & Davis, K. R. (1995). Role of the phytotoxin coronatine in the infection of Arabidopsis thaliana by Pseudomonas syringae pv. tomato. MPMI-Molecular Plant Microbe Interactions, 8(1), 165-171. Zheng, X. Y., Spivey, N. W., Zeng, W., Liu, P. P., Fu, Z. Q., Klessig, D. F., … & Dong, X. (2012). Coronatine promotes Pseudomonas syringae virulence in plants by activating a signaling cascade that inhibits salicylic acid accumulation. Cell host & microbe, 11(6), 587-596. This entry was posted in adaptation, blogging, evolution, genomics, plants, Science Communication, selection and tagged Arabidopsis, bacteria, infection, scicomm, Science Communication. Bookmark the permalink.